Fox News carried about one minute of this, and then cut away to talk about Reverend Wright. Earlier today, Barack Obama made a comment that all three candidates — including John McCain — would be better presidents than Bush. Hillary pounced, and accused Obama of “cheering on” McCain. It wasn’t very long ago that Hillary WAS TELLING US THAT MCCAIN WAS MORE QUALIFIED TO BE PRESIDENT THAN OBAMA. SHE WAS TELLING US WHAT A GOOD MAN MCCAIN WAS WHEREAS WE HAD TO QUESTION OBAMA’S CHARACTER. Hillary is the one who ENDORSED McCAIN. Not once, but three times. Hillary Clinton is insane with desperation. There’s no other way to look at it anymore. The creationist propaganda film “Expelled,” built around dishonest accounts of academics “oppressed” for not believing in evolution, and attempting to link people who believe in evolution with Nazi and Stalin-era atrocities, is a flop. If numbers are any indication, Ben Stein has shown he’s no Michael Moore. Stein’s Expelled: No Intelligence Allowed, a documentary which makes an argument for intelligent design over the theory of evolution, debuted at just number eight among the top ten grossing movies last week. The film made $1.2 million on Friday in 1,052 theaters. By comparison, Michael Moore’s ‘Sicko’ raked in $23.9 million its opening weekend from just 441 theaters, and Fahrenheit 9/11 did $23.9 million from only 868 slots. I about pissed my pants the other night when I saw a TV commercial as I was fast forwarding through a show on my DVR. I could have sworn it looked like Pat Robertson sitting romantically close to Al Sharpton on a love seat. I rewound just to make sure the loneliness hadn’t driven me over the edge. Sure enough, my eyes were not deceiving me. There they were, laughing about how they were on opposite sides of just about every fence there is… EXCEPT GLOBAL WARMING. 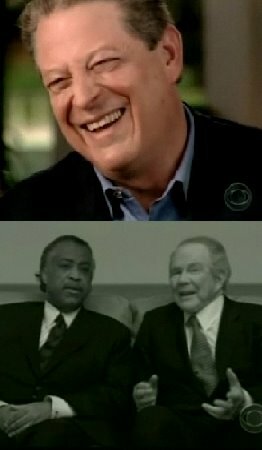 Yes, Pat Roberston and Al Sharpton did a global warming commercial together. And they’re doing it for Al Gore!